Those who attended Aida's class last Dec 2009 decided to have a canvas swap. We drew name and I got Michelle's name. I finally got to pass my canvas to Michelle last month. I love this quote alot and decided to use it on the canvas. I enjoyed the process of misting, painting with crackle paint and masking as well. Seriously thought this hard before I began. I wanted to have a story behind the whole process of creating this canvas instead of a random one. I created a dark looking background that represents when we are down- low esteem - or simply we have no mojo. 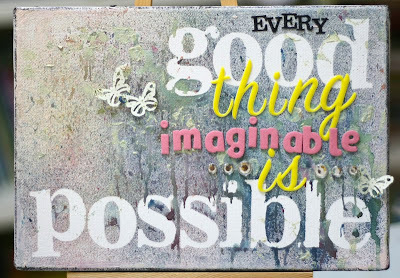 Then, I used brighter alphabet for the words to encourage our inner being that "good thing imaginable is possible". The quote is so appropriate to lift our spirit up anytime of the day! Don't you think so? Sometimes just a little thought, will make our crafty piece looks interesting! Wow, that's so so so so beautiful!!! Nice job! I agree that it is a great quote. Like how you have used different types as well as colours for the quote itself. LOVE this canvas...i love the quote and i love how it turned out...wonderful, wonderful job!! wahhhh..... really love this! So nice!!! WOW babe! I just have to say that this is awesome! What's even more awesome is that behind the creating process, there's a meaningful story! This will definitely lift up anyone's spirit! Thanks so much for this beautiful and thoughtful canvas. I love it. That is awesome!!! Love the meaning behind the colour and love the quote too!! Wow! This is awesome!! And yes! I totally love the quote!